Indian flatbread with lauki. It is mostly North Indian Recipe. which is dangerous to us. You can also make it for breakfast or packed with kids tiffin. Coriander(Dhania) leaves finely chopped 1/2 small bunch. 1. 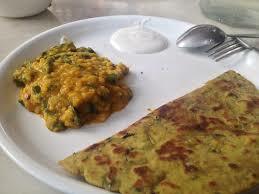 Take a bowl put whole wheat flour, gram flour, grated lauki. 2. Now put all masalas into it. 3. Now put the yogurt according to the consistency of the dough. 4. Make a fine dough of it. 5. Now make equal small balls of this dough. 6. Put it on the surface counter of the kitchen by dusting some wheat flour on it. so that it does not stick to the surface and rolling pin. 7. Roll a circular shape of chapati of it. 8. Now put the tawa on the flame. 9. Shake this thepla on both the sides on slow flame. 10. Put ghee on the thepla. And now take it out in the plate. 11. Make same theplas of remaining balls, and shake it on the tawa. 12. Serve it with curd or any other chutney as you wish.